A WW1 medal group (with WW2 era Defence Medal), awarded to 230090, Gunner, Alec Mardlin, who served with the 392nd Siege Battery, Royal Garrison Artillery in France (where he was wounded, suffering a gunshot wound to the right arm), Mesopotamia and Egypt. Mardlin further enlisted for an additional period of service after the war, but was discharged (due to sickness) during this time and was released. British War Medal and Victory Medal named to 230090 GNR. A. MARDLIN. R.A.
Mardlin was born on the 10th November 1897, at Stevenage, Hertfordshire. His life on Ancestry has been fully mapped out and he features in a number of Ancestry ‘Family Trees’, which can be viewed by clicking on here. Before enlisting, (on the 16th October 1916), he worked as a Labourer in and around his home town. 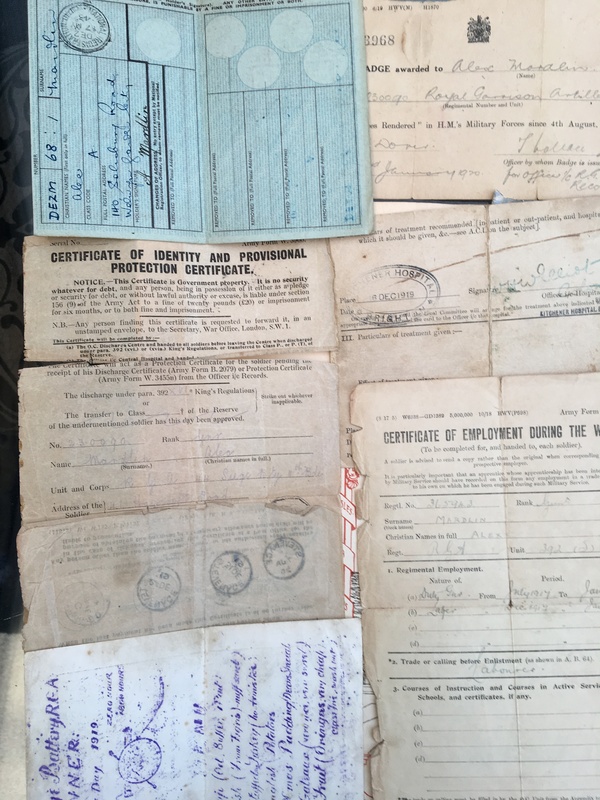 Although I’ve not been able to locate his service records, his pension records can be viewed, (if you have access to Ancestry), by clicking on here. 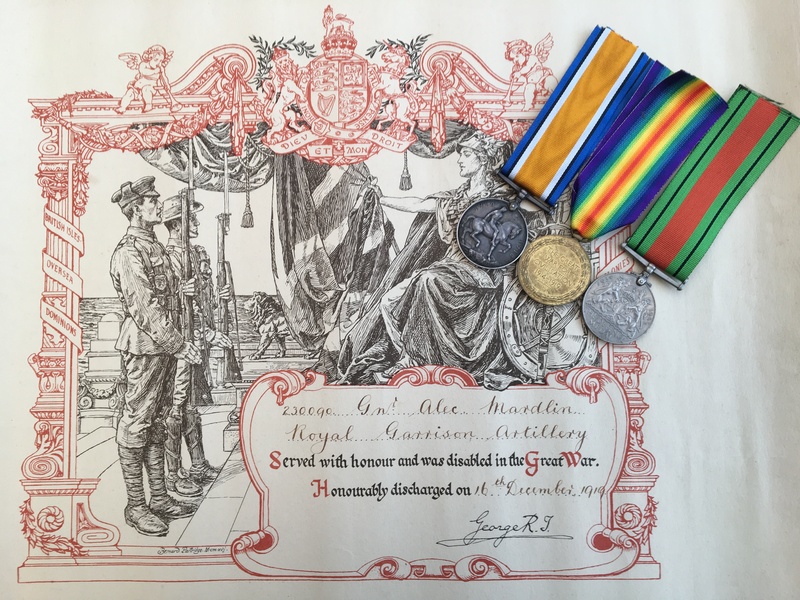 These records confirm that he was serving with the 392nd Siege Battery RGA when it was transferred (from England) to the Western Front, landing in LeHavre on the 26th July 1917. The records also show that he received a gunshot wound to the right arm in September 1917 which left him in hospital for nearly a month. He returned to duty just before his battery left France and transferred to Mesopotamia in October 1917. His unit would have taken part in the campaign on 1918, details of which can be viewed by clicking on here. The battery departed from Basrah and landed at Suez in May 1918, and served with 75th Division in the Egyptian Expeditionary Force, details of which can be viewed by clicking on here, and the battery would have taken part in the Battle of Megiddo, Battle of Sharon, and the Battle of Nablus. 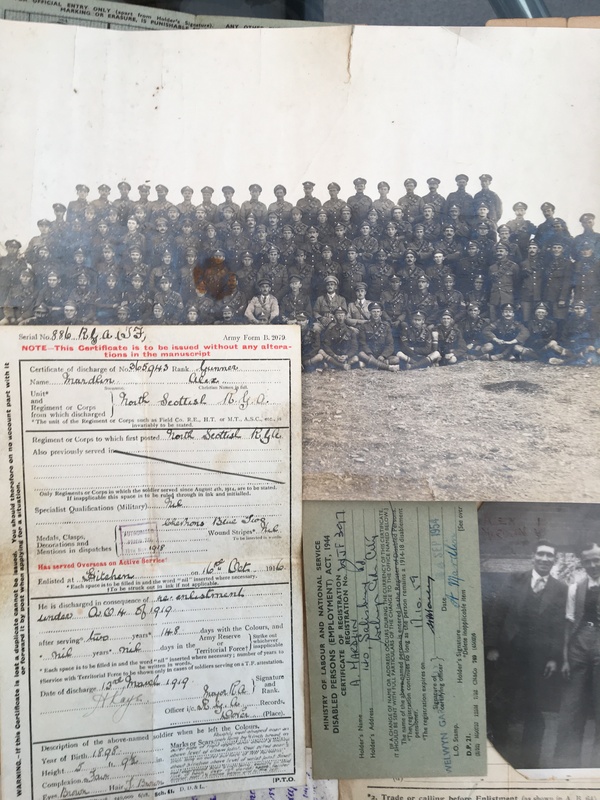 When the conflict ended, Mardlin signed on for additional service in Egypt, (agreeing to serve till March 1921) and served in Palestine with the 11th Brigade serving with both the 42nd and 44th Batteries. Unfortunately, In May 1919 he became sick and was sent home. Following several months in the UK he was finally discharged from the service on the 16th December 1919. His Medal Index Card which can be viewed by clicking on here, (again if you have access to Ancestry, although a paper copy will be provided with this listing), also shows that he received a Silver War Badge, details of which can be viewed by clicking on here, (again if you have access to Ancestry). 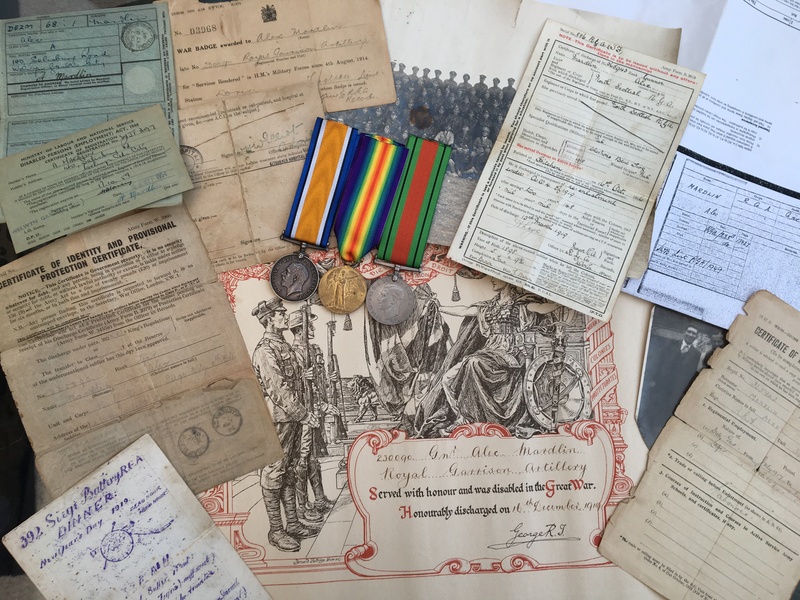 By the time of the onset of WW2, he was still living in the Stevenage area and his details can be viewed on the 1939 Register by clicking on here, (if you have a subscription to ‘find my past’). 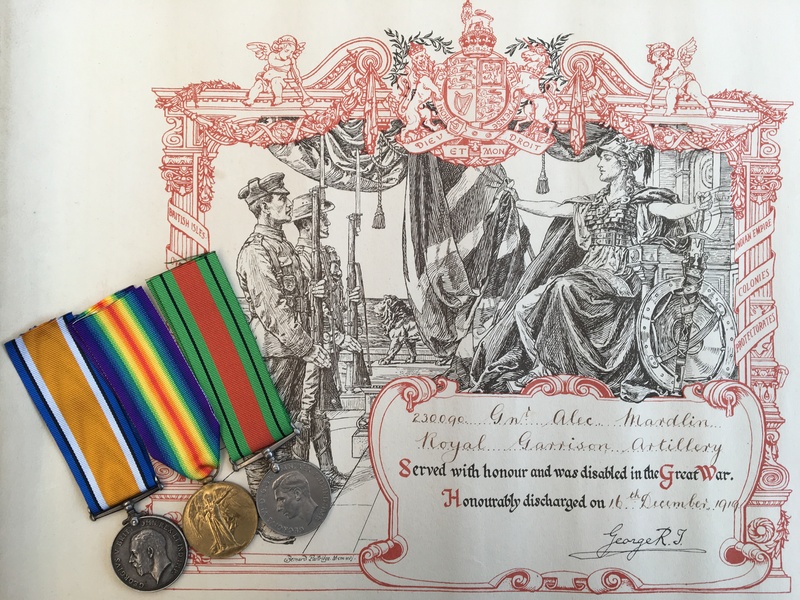 On the basis that the group also includes a WW2 Defence Medal it is likely that Mardlin, who would have been in his forties by this time, undertook some civil defence work or joined the Home Guard. Mardlin died near to Stevenage in January 1964 at the age of 67, but was survived by his widow, I don’t believe he had any children.